The Characteristics of Mechanical Engineering Systems focuses on the characteristics that must be considered when designing a mechanical engineering system. Mechanical systems are presented on the basis of component input-output relationships, paying particular attention to lumped-parameter problems and the interrelationships between lumped components or ""black-boxes"" in an engineering system. Electric motors and generators are treated in an elementary manner, and the principles involved are explained as far as possible from physical and qualitative reasoning. This book is comprised of five chapters and begins with an introduction to the engineering system and how it works, citing a number of examples such as internal combustion engines, electric generators, and power converters in series. The discussion then turns to power conversion, with emphasis on general forms of converter output characteristic, demand characteristic, and efficiency characteristic. Power transmission is also considered, along with dynamic performance and energy storage. The final chapter examines the linear dynamics of mechanical systems and covers topics such as small excursion dynamics, integral control, and sinusoidal disturbance. Examples of control systems are given. 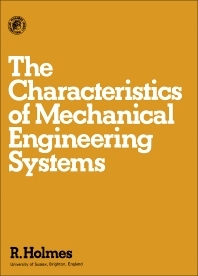 This monograph should be of interest to mechanical engineers.